Its been quiet on my side of the computer screen; was in a road collision a few weeks back and have been in the process of recovering and getting car fixed. Now back on track, and the first thing to share with you is my first networking event of the year; MKNF. This being a monthly event held for filmmakers, actors and anyone who works in Media. When I got to the venue I thought it had been cancelled as the shutters to the doors going in were down, to only realise that the networking night was across the way in another gallery. Once inside and others had arrived it was a case of saying hi and striking up a conversation, with a few ice breakers along the way. I and others who attended took the opportunity to meet and network, I especially got to meet people I am friends with on Facebook who live in the same district/ region as me. I went prepared; a tree stump of business cards at the ready to hand out. When it got started the guy who had arranged the night noted that there were a few me people, specifically me and I had to go first in introducing myself. I asked if I should stand up and some of the guys joked/ suggested that I should stand on the bar and introduce myself, oh the wit of many and yes I did laugh at the idea. This month’s event was a mixture of video clips covering different aspects of filmmaking, such as acting, directing and editing, all featuring professionals from the industry; specifically from BAFTA. These were delivered interviews from Idris Elba, James McAvoy, Jim Broadbent, Alfred Hitchcock, David Lynch and my favourite was from Andrew Lincoln from the ‘Walking Dead’. During Andrew’s interview he revealed how he had to change his last name, under the advice of his agent as the agent said his last name ‘sound like something out of Lord of the Rings; Clutterbuck (what a name). There was also a video clip called a Recipe for Disaster on what you need and is part and parcel of making films, which many of us can and could relate too. We cracked jokes about that; I notice there was not enough emphasis on booze, nothing on swearing or anything on smoking as it is stressful at times. When I walked back in I felt great having met so many people who are in the same industry as me and fingers crossed I get to work with some or even all of the people that I have met tonight later down the line this year or in the foreseeable future. Well that goal/ challenge is gonna be on hold for a week as I am abroad for a break, a break abroad that I haven’t taken in, wait for it, 11 years. hopefully the people I have met face to face rather than just on Facebook and others who are not on my Facebook get the chance to work together this year or next year on upcoming productions, only time will tell. The clue is in the title of the post what I have been doing. I am having a blast working on ‘Brothers’, will be sad when it come to an end, though between that I heard that there was a film company looking for extras for a film on aviation safety looking for extras and production runners. I contacted them through their website and forwarded my CV and wanted to hire for me for the two days they were in my hometown. This was both unexpected and an enormous surprise for me. The film crew also asked me to spread the word for in and around my hometown to be extras, and what better way to do this then via Facebook and Twitter (you gotta love the internet). On my first day I met several members of the cast and crew and decided to get started by helping Jo set up tea, coffee and food table. In addition to this, I did a few tasks in the office and drove to set a couple of times, and the first time I did it was a great surprise seeing so many planes. It was so cool going on a plane, and after meeting Tristan, the Director, I even got a chance to go into the cockpit and had fun seeing how to fly a plane. Soon it was time to wrap first day and it had gone in the blink of an eye. The next day it was all hands on deck as there were lots of extras to look after. Once they were all on site, it was a case of them all going to the location for filming, and I followed as I was going to be on the plane as a passenger during filming which was really cool. During the breaks between filming I got the chance to have a chat with some of the other extras who had come from all over to be involved. Soon the day came to an end, like yesterday, so quickly and it was that time to wrap so the crew could move onto the next location for filming. Overall, I have enjoyed my two days working with ‘Fact Not Fiction Films’, and working with a great team Emily Production manager, Giuseppe 2nd AD, Sarah Assistant Producer, Christianne 1st AD, Nick DOP, Emma, Leah, Kat the actresses and Location Manager, Jo who did an awesome job with catering, Pete, Sam, Tristan the Director who like everyone else (Camera crew and rest of the team) made me feel very welcomed on set and during the two days. I hope I get to work with the team again in the foreseeable future. Whilst filming was happening for the two days, I got the chance to see lots of cars mainly BMW s racing round the aerodrome track, and I thought how cool it would be if I could do that one day. Or it could be an idea for someones birthday/ Christmas gift. At least I am starting to fulfill my New Years Resolution; to get experience/ work in films as I have more in TV than film, so I have more areas of experience and come more symmetrical. I hope I have more great news to share with you all. Hope you all enjoy my posts. I hope I get to work with the team again on future productions. I have some good news to share at last; I am working on a feature film that is being filmed in the East Midlands. I am excited because it is the first feature I have worked on, as most of my experience is engulfed in TV, so it is pretty cool to be given the chance to be part of something great. It is an action film that focuses on two brothers and the lengths they will go to for justice, in their own way. My first day with filming had to be on a day where it rained, though it did stop after 3pm, which was a bonus. When I got to the location I met some of the actors and extras who would be appearing in the film. I then met our director; Darren Lynch and after meeting everyone else I was ready to get started. Although my role is production runner, I also was the Sound Recordist something I have never done before, but it was awesome trying something new, so I am taking on two roles. Filming finished late afternoon and we got most of the days scenes shot, I just hope I did a good job mainly as the sounds person, and that I can be for the rest of filming. At least I have fulfilled my new years resolution to gain experience in films, in order to have more dimensions to my experiences. 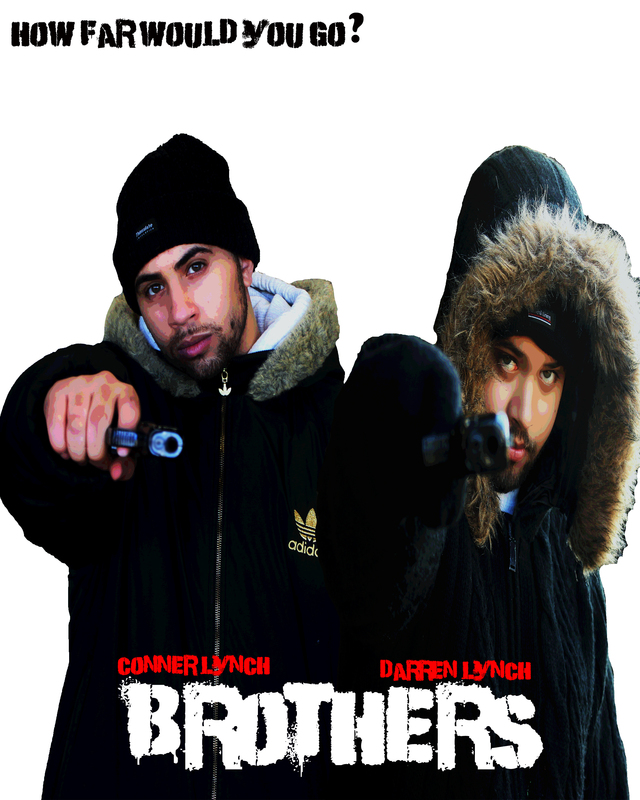 For now enjoy this poster of the film ‘Brothers’, synopsis will either follow, or can be found on the internet. Hopefully over the next couple of days there will be photos and film footage of behind the scenes filming of this really cool feature. More to follow.